SmartDeviceLink works by sending remote procedure calls (RPCs) back and forth between a smartphone application and the SDL Core. These RPCs allow you to build the user interface, detect button presses, play audio, and get vehicle data, among other things. You will use the SDL library to build your app on the SDL Core. You will need a class that manages the RPCs sent back and forth between your app and SDL Core. Since there should be only one active connection to the SDL Core, you may wish to implement this proxy class using the singleton pattern. Your app should always start passively watching for a connection with a SDL Core as soon as the app launches. The easy way to do this is by instantiating the ProxyManager class in the didFinishLaunchingWithOptions() method in your AppDelegate class. The connect method will be implemented later. To see a full example, navigate to the bottom of this page. At the top of the ProxyManager class, import the SDL for iOS library. The SDLManager is the main class of SmartDeviceLink. It will handle setting up the initial connection with the head unit. It will also help you upload images and send RPCs. In order to instantiate the SDLManager class, you must first configure an SDLConfiguration. To start, we will look at the SDLLifecycleConfiguration. You will at minimum need a SDLLifecycleConfiguration instance with the application name and application id. During the development stage, a dummy app id is usually sufficient. For more information about obtaining an application id, please consult the SDK Configuration section of this guide. You must also decide which network configuration to use to connect the app to the SDL Core. Optional, but recommended, configuration properties include short app name, app icon, and app type. There are two different ways to connect your app to a SDL Core: with a TCP (Wi-Fi) network connection or with an iAP (USB / Bluetooth) network connection. Use TCP for debugging and use iAP for production level apps. If you are connecting your app to an emulator using a TCP connection, the IP address is your computer or virtual machine’s IP address, and the port number is usually 12345. This is a shortened version of your app name that is substituted when the full app name will not be visible due to character count constraints. You will want to make this as short as possible. lifecycleConfiguration.shortAppName = "<#Shortened App Name#>"
This is a custom icon for your application. Please refer to Adaptive Interface Capabilities for icon sizes. Persistent files are used when the image ought to remain on the remote system between ignition cycles. This is commonly used for menu artwork, soft button artwork and app icons. Non-persistent artwork is usually used for dynamic images like music album artwork. The app type is used by car manufacturers to decide how to categorize your app. Each car manufacturer has a different categorization system. For example, if you set your app type as media, your app will also show up in the audio tab as well as the apps tab of Ford’s SYNC3 head unit. The app type options are: default, communication, media (i.e. music/podcasts/radio), messaging, navigation, projection, information, and social. Navigation and projection applications both use video and audio byte streaming. However, navigation apps require special permissions from OEMs, and projection apps are only for internal use by OEMs. If one app type doesn't cover your full app use-case, you can add additional AppHMITypes as well. You can alter the appearance of your app on a head unit in a consistent way using template coloring APIs. This will only work when connected to head units running SDL Core v5.0 or later. You may only change the template coloring in the lifecycleConfiguration and in SetDisplayLayout RPC requests. You may only change the template coloring once per template. i.e. You cannot change to the same template you are already on using SetDisplayLayout and expect the coloring to change. You have the ability to determine a minimum SDL protocol and minimum SDL RPC version that your app supports. We recommend not setting these values until your app is ready for production. The OEMs you support will help you configure the correct minimumProtocolVersion and minimumRPCVersion during the application review process. A lock screen is used to prevent the user from interacting with the app on the smartphone while they are driving. When the vehicle starts moving, the lock screen is activated. Similarly, when the vehicle stops moving, the lock screen is removed. You must implement a lock screen in your app for safety reasons. Any application without a lock screen will not get approval for release to the public. 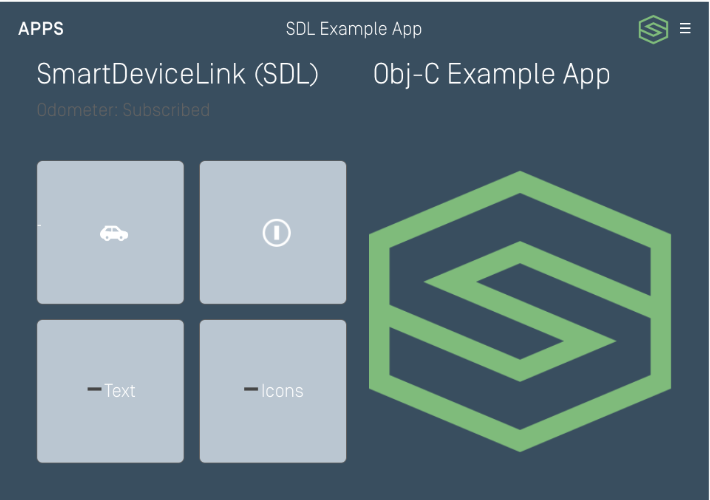 The SDL SDK can take care of the lock screen implementation for you, automatically using your app logo and the connected vehicle logo. If you do not want to use the default lock screen, you can implement your own custom lock screen. For more information, please refer to the Adding the Lock Screen section, for this guide we will be using SDLLockScreenConfiguration's basic enabledConfiguration. A logging configuration is used to define where and how often SDL will log. It will also allow you to set your own logging modules and filters. For more information about setting up logging, see the logging guide. The SDLConfiguration class is used to set the lifecycle, lock screen, logging, and optionally (dependent on if you are a Navigation or Projection app) streaming media configurations for the app. Use the lifecycle configuration settings above to instantiate a SDLConfiguration instance. Now you can use the SDLConfiguration instance to instantiate the SDLManager. The manager should be started as soon as possible in your application's lifecycle. We suggest doing this in the didFinishLaunchingWithOptions() method in your AppDelegate class. Once the manager has been initialized, it will immediately start watching for a connection with the remote system. The manager will passively search for a connection with a SDL Core during the entire lifespan of the app. If the manager detects a connection with a SDL Core, the startWithReadyHandler will be called. Create a new function in the ProxyManager class called connect. In production, your app will be watching for connections using iAP, which will not use any more battery power than normal. If the connection is successful, you can start sending RPCs to the SDL Core. However, some RPCs can only be sent when the HMI is in the FULL or LIMITED state. If the SDL Core's HMI is not ready to accept these RPCs, your requests will be ignored. If you want to make sure that the SDL Core will not ignore your RPCs, use the SDLManagerDelegate methods in the next section. The following code snippet has an example of setting up both a TCP and iAP connection. private let appName = "<#App Name#>"
private let appId = "<#App Id#>"
managerDidDisconnect This function is called when the proxy disconnects from the SDL Core. Do any cleanup you need to do in this function. hmiLevel:didChangeToLevel: This function is called when the HMI level changes for the app. The HMI level can be FULL, LIMITED, BACKGROUND, or NONE. It is important to note that most RPCs sent while the HMI is in BACKGROUND or NONE mode will be ignored by the SDL Core. For more information, please refer to Understanding Permissions. audioStreamingState:didChangeToState: Called when the audio streaming state of this application changes on the remote system. For more information, please refer to Understanding Permissions. systemContext:didChangeToContext: Called when the system context (i.e. a menu is open, an alert is visible, a voice recognition session is in progress) of this application changes on the remote system. For more information, please refer to Understanding Permissions. managerShouldUpdateLifecycleToLanguage: Called when the head unit language does not match the language set in the SDLLifecycleConfiguration but does match a language included in languagesSupported. If desired, you can customize the appName, the shortAppName, and ttsName for the head unit's current language. For more information about supporting more than one language in your app please refer to Getting Started/Adapting to the Head Unit Language. You should now be able to connect to a head unit or emulator. From here, learn about designing your main interface. For further details on connecting, see Connecting to a SDL Core.